Plain and simple but oh so yummy. Shawarma night tonight. Plain and simple but oh so yummy. Put about a tablespoon of oil in a pan. When heated, add meat and cook until just lightly browned. Let simmer on very low heat till nicely cooked. Hummus, Techima, Pickles, Potato fries sliced in circles (I had that in Israel), eggplant, pickled cucumber and generally, whatever you feel like. I buy my pitta from either Woolworths or Anat (prefer them). Wherever available is perfect and even if you know how to make them, even better. Cut a very small slice off the top enabling you to get inside and then start with your spreads and then add your meat and salads alternatively all the way to the top. I am getting hungry reading this. I have not eaten a Shawarma. If Shawarma is similar to the Turkish Döner here in Germany, then I have eaten this already. Well, it looks the same like in your photo. Thanks for sharing. I might make this. 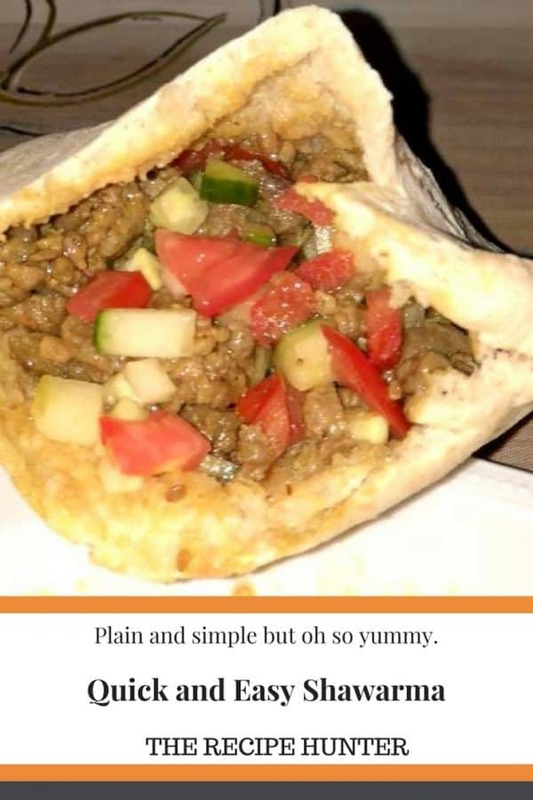 Not familiar with a Turkish Döner but Ms Google seems to think it may be the same, so hope you will enjoy this one as well.